1. I create the visuals myself using Adobe Illustrator, my brain and a little synthesis. 2. The visuals are designed to be shared, distributed and used outside of this blog. 3. I not only appreciate credit, I know that when it's given it benefits everyone. "Dear David, I was recently at a conference where a prominent speaker was using several of your visuals in their presentation without any credit whatsoever. I thought you should know." "David, today I was asked by a supervisor to trace over one of your visuals, so that we could make it our own. I have an issue with this". Here's the deal. The visuals here are "free" for everyone to use. They are my "purple cow"—it's why most of you are readers of this blog in the first place. And I respect that—which is why I freely give them away. But when you take what's free and bury the source, it actually effects your own credibility more than you know. Take this for example. 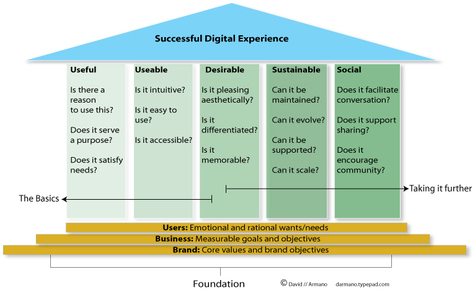 One of the most popular visuals on this blog is the experience map. It was one of my first and I was naive enough not to put my name on it. No doubt some folks have taken advantage of that fact. But Google tells another story. Thanks to the Long Tail, if you type in "Experience Map"—my visual is the #1 result. That's better than any copyright I can throw on a graphic. So take this advice if you like. If you want to use a visual here without credit—it's your choice. I can't force you to do so. But this blog is out there—it's highly visible and it's very likely that someone who viewed your presentation with my visual will eventually find the source here. And that affects your credibility, not mine. For those of you who have been generous in your transparency—thank you. I owe the success of this blog to all of you. I've given a lot away here, but you've given me much more.